Because I Want To Get To The Easel…..
Too many non-painting tasks this morning. I’m usually at the easel by lunchtime, but not today. It’s something we all have to figure out- how to get everything done and still have time to do what we want and need to do, which is to make art. So, I’m going to offer some quotes I like for a rainy afternoon in Humboldt County. And then GET PAINTING! I know the feeling about too many non-related painting tasks! Because I do work outside the art field, this is a constant fight to balance creating art and having a life. So glad you have more time to create, & blog! By the way, I am watching “The Long Way Around” with my boyfriend. Part of the travel was through Mongolia. Wow. How beautiful!!! I thought of you the entire way through the section of the series! It was great knowing a little more about Mongolia through your writings and then watching Ewan & Charlie ride their BMW bikes through it. Was the flower your next painting? What a strange idea, because I am spoiled by your landscape & animal paintings! I just threw it in for fun. 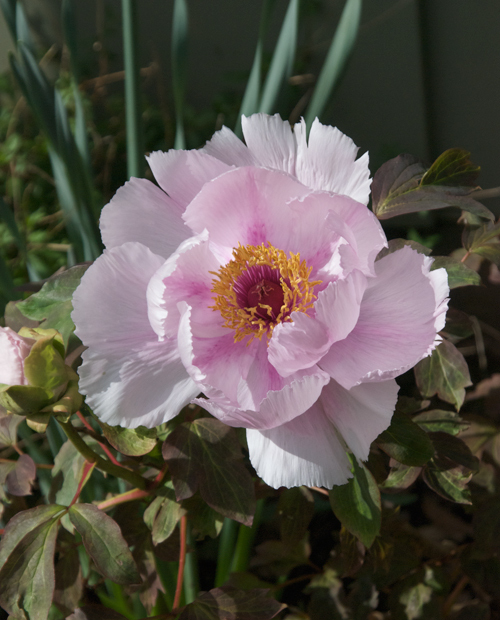 I don’t think peonies are supposed to be blooming this early, but mine sure seem to!